Last week I sponsored a golf charity event that was hosted by the president of the Entrepreneurs of Tomorrow club which I am a part of as a mentor. He invited me a few weeks ago and I decided it would be a wonderful opportunity to introduce yet more Frankfurters to cupcakes. 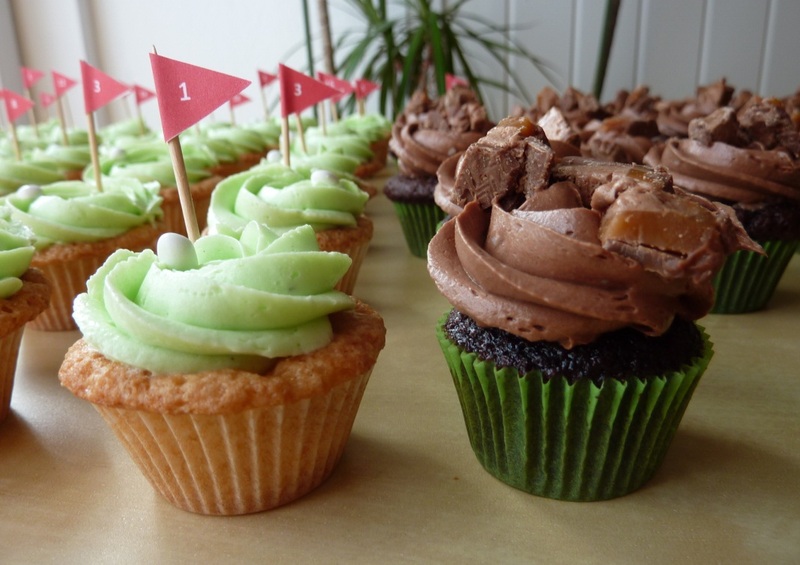 I came up with a simple design as I knew that the majority of golfers would be male so no girlie cupcakes were allowed. I made classic flavours, French vanilla and Belgian chocolate. I frosted the vanilla ones in green tinted buttercream and added a little white M&M flavoured chocolate bean which my Trusty Apprentice recently smuggled in from the UK. I added a little toothpick flag to increase the cuteness. 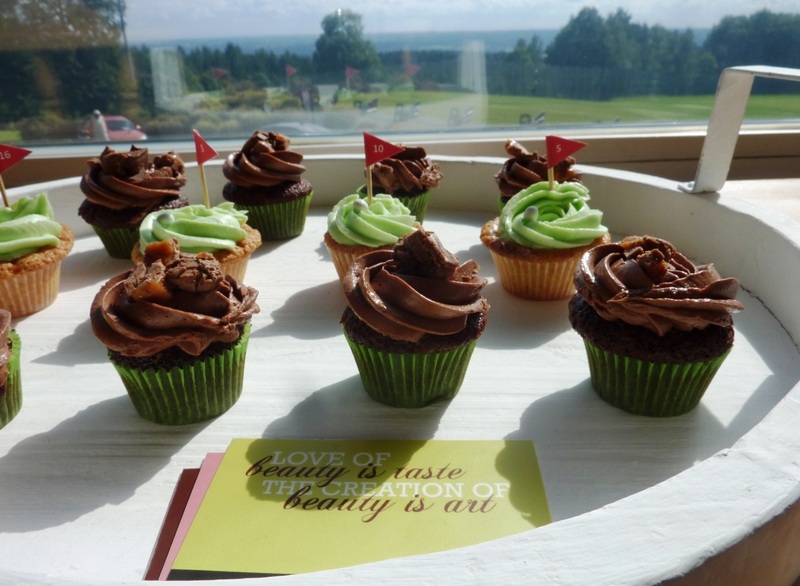 The chocolate cupcakes were decorated with a swirl of chocolate frosting and topped with chopped frozen Mars bars. I scored this awesome vintage tray at Das Depot (no relation. :)) in Frankfurt for €6. Das Depot is the equivalent to say, Home Sense with lots of home accessories. It’s usually super over-priced but had a sale on. Woo hoo! Once the golfers came in and finished lunch, I walked around with tray and distributed them. I love interacting with people and talking about my favourite topic (cupcakes!) so it was a fun afternoon. P.S. Stay tuned for my next post ─an autumn-inspired photo tutorial. Anyway, just wanted to say that your cupcakes are stunning!!! The Ewa Feix Akademie is now Open! dascupcake on	Flour in Germany, Type 405. What the hell? Yes, the higher the gluten, the better for the pizza dough! You are absolutely right! Andreas Wiedow on	The Ewa Feix Akademie is now Open! curso fondant on	The Ewa Feix Akademie is now Open! Andrew on	Flour in Germany, Type 405. What the hell?